Berkshire Hathaway Inc. added to its stakes in two of Warren Buffett’s most favored industries as the billionaire investor widened bets in banking and the airline industry. Berkshire boosted investments in Goldman Sachs Group Inc., US Bancorp, Delta Air Lines Inc. and Southwest Airlines Co. in the second quarter, the Omaha, Nebraska-based company said Tuesday in a filing. Buffett’s company now holds 13.2 million shares in Goldman Sachs, valued at US$2.9 billion at the end of June. 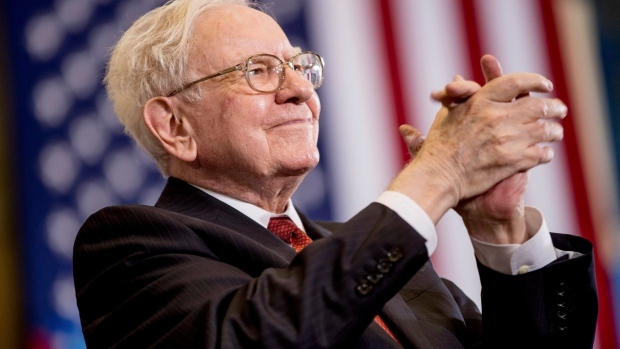 Buffett, 87, and his deputies have been shifting the conglomerate’s US$180 billion stock portfolio, exiting some longtime investments including International Business Machines Corp. and piling into newer holdings such as Apple Inc. The investor has major stakes in the four biggest U.S. airlines and four of the seven largest lenders. Berkshire cut stakes in American Airlines Group Inc., United Continental Holdings Inc. and Wells Fargo & Co. to avoid surpassing 10 per cent ownership in each of those companies, a threshold he said he didn’t want to cross. Berkshire’s stake in American Airlines decreased 2.8 per cent to 44.7 million shares and the Wells Fargo holding declined 1 per cent to 452 million shares, valued at US$25 billion. “These buy and sell decisions did not reflect our investment management’s views as to the relative attractiveness of the bought and sold securities but were rather a response to the 10% limitation,” Berkshire said Monday in a statement, while not disclosing what specific stakes increased or decreased. Goldman rose as much as 1.3 per cent in extended trading after Berkshire’s announcement. Southwest, Delta and US Bancorp all moved higher. Buffett’s company boosted its stake in Apple 5.2 per cent in the second quarter, just months before the iPhone maker made history as the first U.S.-based company with a market value of US$1 trillion. Shares of the iPhone maker climbed 9.4 per cent in the first half and have continued to gain.